Spend a couple of minutes poking around Google for "the $3 peach" and you will find multiple, tired complaints of the cost of produce at the Ferry Plaza Farmers' Market. At some point, instead of finding new reasons to complain about this nationally renowned farmers' market, a lot of writers began to refer to the cost of some of the peaches at the market. Echoing my own thoughts, a commenter last year on Michael Bauer's blog wrote, "If I hear one more reference to the $3 peach I will scream." My issue is not that people are complaining about the market. It's that the complainers don't manage to come up with anything more exciting than an old reference to the cost of a very small percentage of the peaches at the market. I have never spent $3 per peach at the market and I shop there (and buy peaches) as often as I can. 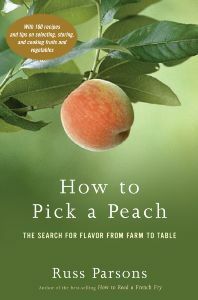 Because this complaint is often a thorn in my side, my ears perked up when I heard that Russ Parsons, writer for the Los Angeles Times and author of How to Read a French Fry, had written a new book, How to Pick a Peach: The Search for Flavor from Farm to Table. Parsons is known for his meticulous examination of a topic once he decides to study it, and in this book he has taken on fruits and vegetables. Parsons' book gave me answers about why some peaches are more expensive than others, what makes some peaches so satisfying, and taught me about the economics of small farming and the realities of the true cost of a peach. The book is reference-style and is broken down by section for selected fruits and vegetables. In each section he outlines where the fruit or vegetable is grown, how to choose it, how to store it, how to prepare it, and includes recipes. While he uses peaches as a vehicle for some of the discussion of commercial agriculture, he covers fruits and vegetables from apples to winter squash. The rest of How to Pick a Peach is peppered with discussions of the food industry, the selection of new fruit varietals, and big farming vs. small farming. Which brings us back to the peach. Commercial agriculture is most often all about bringing the consumer a good-looking product to the supermarket and small farming is usually about bringing intense flavor from lesser-known varietals to the consumer. Parsons introduces us to Fitz Kelly and Art Lange, stone fruit growers in the Central Valley who take their fruit to Southern California farmers' markets (Until 2006, Kelly also brought his fruit to the Ferry Plaza Farmer's Market). Whereas most commercial farmers harvest their fruit as soon as it is minimally acceptable to take to market, small farmers push their fruit to stay on the tree until the last possible minute, often gambling entire crops in order to push the flavor a little bit more for the consumers. They pick only the perfect fruit and leave a lot on the tree or on the ground because it's not just right for market. "The cost of perfection is enormous," writes Parsons. "Whereas the average stone fruit farmer in California harvest about ten tons per acre, Lange and Kelly only pick two or three. This difference in sales volume could never be recouped through normal commercial channels; it is only by direct marketing that growers can get a premium for a great product. Peaches and nectarines at many supermarkets can go for less than $1 a pound, and even good farmers' market fruit might sell for $2 a pound, but stone fruit grown by these two men fetches far higher prices. And people stand in line to buy it. Even at those elevated prices, however, the economics are tough. Multiply an average of $4 a pound by two tons per acre, and you're still barely in the black -- especially when the profit is spread over so few acres." Reading about the hard work, thought, and even the chance that goes into getting our peaches to market made me want to go and hug my favorite stone fruit farmers: the farmers from Tory Farms, Woodleaf Farm, and Blossom Bluff Orchards. Most peaches at the Ferry Plaza Farmers' Market do not cost $3 each. But even if they cost $3 or $4 or $5, after reading this book I would bet that you'd find room in your budget for one or two.